When the user is presented with a list of items in the DetailViewController.xib file, she can put the view’s tableView control in edit mode by simply taping the navigation bar’s Edit button. The app respond by putting editing controls in the tableView rows as shown in Figure 1. Controls you see on the right side of the table rows are reordering controls. Those on the left are delete controls. Now, to implement reordering rows of the tableView control that’s on the DetailViewController’s view, you’ll have to first add an Edit button on the view’s navigation bar. So add this code in the DetailViewController.m file’s viewDidLoad method. Next, add this code in the file. It is fired when the operator tap the Edit button, resulting in output you see Figure 1 above. Next, add this method in the file as well. It is fired when the user reorder any row of the tableView control. 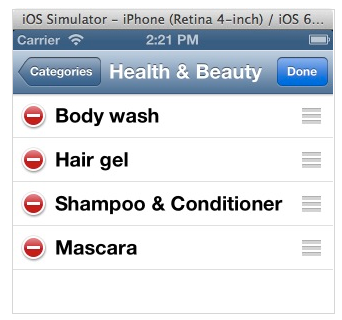 As you can see, the last statement is sending a message to the addShoppingListItems method. You’ll have to declare and implement it in the AppDelegate class. You can run the app now. Tap the Edit button then reorder the tableView’s rows to your hearts content. When you are done tap the Done button to put the tableView control back in normal mode. Relaunch the application to see that the order you put the tableView rows persisted.